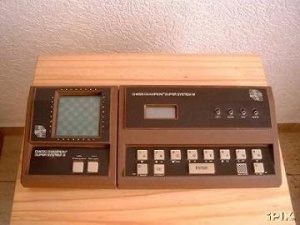 Novag's third dedicated chess computer released in 1979, at about the time that the Novag / SciSys split took place. After the early sales period different SciSys and Novag versions of the Super System III emerged, the early Chess System III, the later SciSys ChessMaster, and the Chess Champion Super System III by Novag . The chess computer had a 6502 CPU with a Philidor Software program written by Mike Johnson, supported by David Levy with expertise in search heuristics, also providing the opening library. The program and book was stored in 8 KiB of ROM, and used 1 KiB of RAM. It was a kind of modular system with a computer unit, and optionally, a pluggable printer and the very first LCD-chessboard.